Open House is an acoustic world music phenomenon. Drawing strength from the diversity of its musicians, the group takes full advantage of its varied instrumentation, deftly genre-jumping through an assortment of Celtic, American traditional, and eastern European settings. 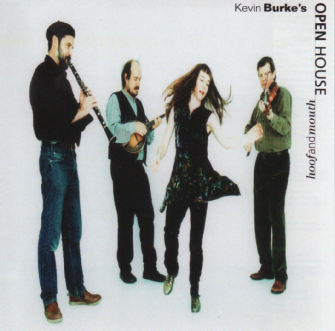 Legendary Irish fiddlerKevin Burke slips easily amongst jigs, reels, bourrées, and polkas, while Mark Graham’s clarinet adds a decidedly old world quality to the ensemble. Citternist Paul Kotapish contributes distinctive original instrumentals, and unique rhythms are provided by Sandy Silva’s driving percussive dance. Finally, the group’s sophisticated repertoire is hilariously complemented by the infectious, tongue-in-cheek songwriting of Mark Graham. Highlights of Hoof and Mouth include the title track, a duet featuring Sandy Silva’s blistering footwork and Mark Graham’s bluesy harmonica, as well as a bare bones rendition of Laura Nyro’s “And When I Die.” Produced by Ged Foley, guitarist for Patrick Street and The House Band, this album is a must for any world music enthusiast.